Lovely cookies! The "reindeer food" beads reminded me of a little baggie my mother gave my son one year - It was filled with oatmeal and irridescent glitter, and a cute label that said "Reindeer Food". of course, the intention was for him to sprinkle it over our lawn on Christmas Eve, so that the reindeer would have something to eat while Santa had his cookies! Think I'll go stir up a batch right now..
Yah, that ratio looks pretty much like mine, although I use a GIANT starbucks cup! My kids will love doing this, thanks! Very nice, and so much easier without sticky icing involved. 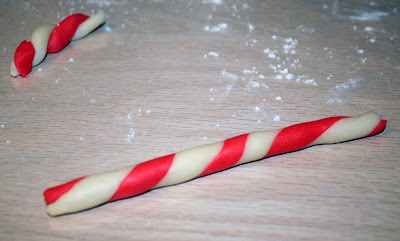 I love the mini candy canes. 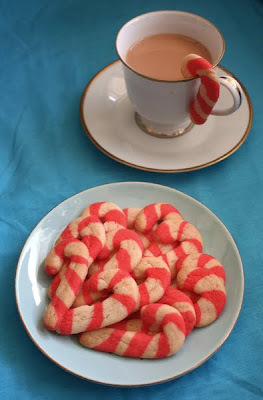 I remember a family friend always making candy cane cookies - they were almost shortbread. So Yummy. If we have time/ bored maybe I'll give it a try with my girls. 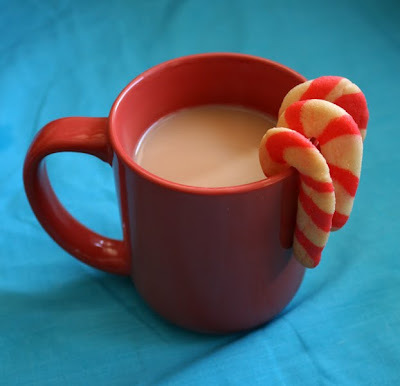 Love the candy cane idea. 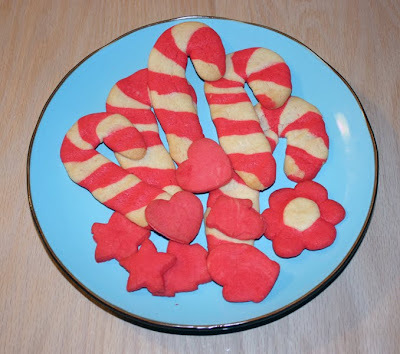 What recipe did you use for the sugar cookie dough? I'll probably get a few more bags of the mix after Christmas though, because they sell them off very cheap because they have images of Christmas cookies on the packaging. Juliana. I'm definitely going to let my kids chuck oatmeal and glitter all over the lawn on Christmas eve. They will think that is hilarious fun! Thanks. That looks like about the size of my tea cup as well. And I drink around 3-4 a day. :) Earl Grey. What about you? 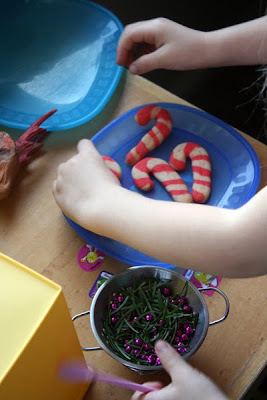 I always make these exact cookies this time of year! 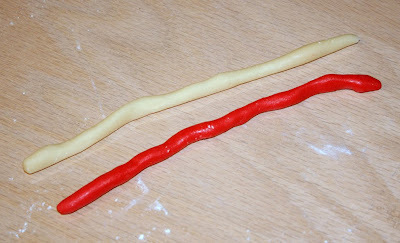 The only difference is that we don't roll ours again after joining them, so they're more 3-D. These are great. I'm going to have to remember these for next year. those looked great! 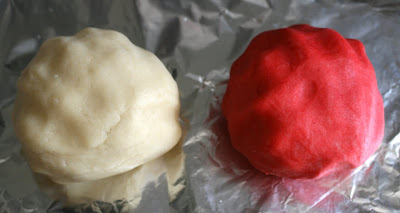 I have been making sugar cookies a ton this week and I just discovered an easy icing that is great. You should try it: about a cup powdered sugar, tsp vanilla, splash of milk and splash of corn syrup. I fool with it until its not too runny but thin enough to spread easily. It is great because it self levels so it looks perfect and it dries hard. I know that I didn't give you real measurements but just wing it and I bet you'll be happy with the results. Those are FABULOUS!!! 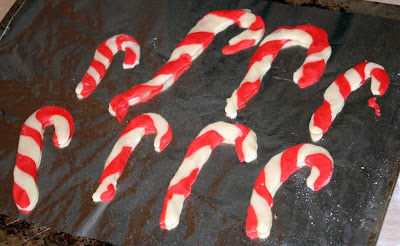 I have such a weakness for frosting... these would be great for next year so I won't be tempted by that sinful icing! 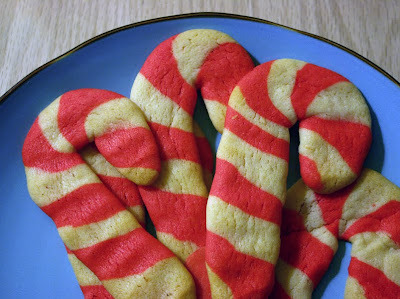 these are some of my husband's favorite holiday cookies. 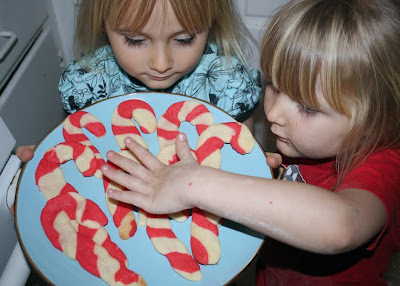 We top ours with crushed candy canes..